Guess what, it’s as easy as ABC to enhance the way your picture libraries look like with very nice inpage popup. Put the jQuery file and fancybox in someplace your user can access. For the sake of simplicity I am going to put these files in a document library for this walkthrough. In a real world scenario I am putting these files in the 12 using a WSP. Push the jquery-1.4.2.min.js and fancybox folder in. Press Ok and enjoy the magic of Fancybox. The result might not yet be perfect; the two following notes shall set everything straight. The path to the pictures in the CSS might need to be modified for the pictures used by fancybox to work . Reload the Image Library in Internet Explorer and the pics shall be there. Of course, this is only a start. 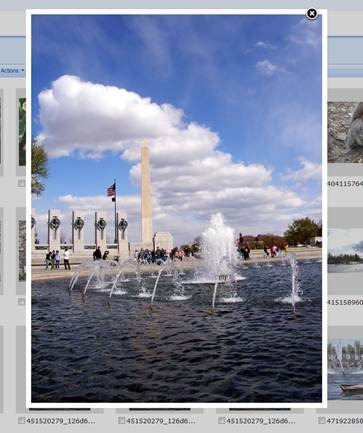 The next step would be to have the picture retrieved by a Content Query Web Part with the fancybox magic added. It would mean losing the option to download multiple picture and it would allow for an even better rendering. Inside the source code, there is some html tag left, check the js and css URL. Thanks for the input, the JS and CSS urls are fixed. I agree, using CDNs are really great but your users needs to have access to the internet and these files shall not be filtered by your client proxy. Moreover some clients provides really poor bandwidth for their users to access the internet. For people fearful of Google, Microsoft is also providing a CDN for common files see, ScottGu's blog (http://weblogs.asp.net/scottgu/archive/2009/09/15/announcing-the-microsoft-ajax-cdn.aspx). What a nice post ! Can you package your awesomizing stuff into a WSP file and propose it as a feature so we can enable it for each web we want to (and for each Picture library, of course). Awesome idea, it would be nice. Yet I got to admit that while it's not such a daunting task it's still a bit of work. Moreover I don't know what fancybox and jQuery licenses would allow me to do. I follow the ABC, but I have no result in my sharepoint library... there is neccesary change or add some code? Hi again Jon, thanks for your support! It's all complete and all right. I am hearing you right, it is now working ? This component doesn't need a list to be configured, just put the code on the display form of the Picture Library and you shall be all set. I tried the following in my sharepoint site but I doesn't do anything. IE8 dev tools highlight the entire code and show an "Object Needed" error. Does this work only for Moss? I've tried it in our WSS 3.0 environment and nothing happens. I've also replaced the library links with CDN's to make sure I'm not dealing with wrong paths for the js and css files. I can't see why it wouldn't work for WSS 3.0. - your include from the CDNs are working ? - the code you pasted in your page is reached ? I used the CDN's from PACMAN's comment on the top of this blog. I'm not sure how to test if the code is reached. We are using IE6 and Firefox. The last two links (Fancybox JS and css) aren't really from a CDNs, it's actually a source control platform. Anyhow, if you want to use it, you shall point to the files not the web page by using the "View Raw file". Be carefull not to mix the JS and CSS reference. I replaced the two links per your advice but still no luck. Thanks for a great post but I'm having some trouble making it work. 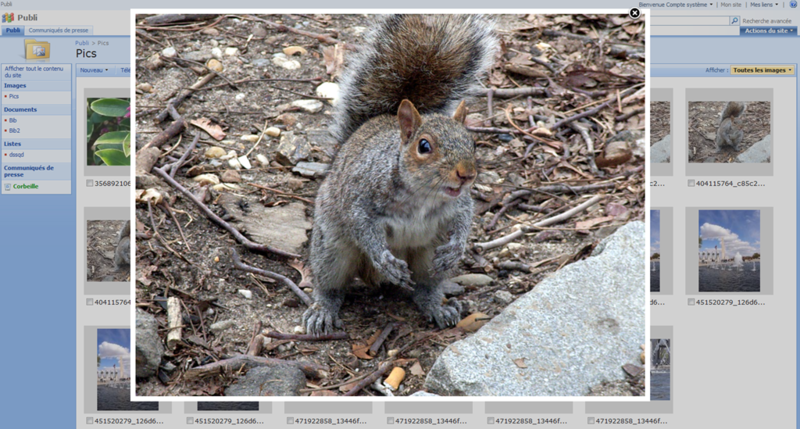 I'm searching the source from a standard OOB "All pictures" view of a Picture Library (MOSS 2007) and don't see anything with a ".thumbnail" class. The selector doesn't find anything to replace so the magic doesn't happen. What did I miss? I did some more digging and found my problem. I was wrong about the selector not finding the thumbnails. The "if" was looking for an "alt" value of "Image". I changed that to "Picture" and everything works as described. Its an eexcellent post which i exactly looking for. You saved my time a lot. 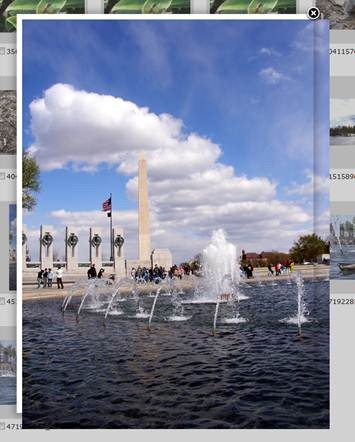 Everything is working fine for able to display the picture, previous,next and close. But the background color is not transparent (grey) as u shown in the blog. It stops in the top around 10px. Will this work in SP2010? It allows to generate preview in SharePoint libraries both for images and files (.doc, .xls, .pdf, etc).